Marvelous Cebu, one of the most developed provinces in the Philippines, located in the Central Visayas Region, takes pride in its many beaches, corals, islands, rich fishing areas, as well as its thriving BPO companies, schools and other business centers for trade and commerce. #1 - Sumilon Island (Cebu Island): have a priceless day tour to unspoiled Sumilon Island! Its fine, white sand, lots of sunshine, swimming, snorkeling and kayaking will definitely delight you and your family. Blue Water Resort manages this beautiful island and will provide you with great customer service, scrumptious buffet, plus a guide towards their lighthouse which is just an easy trek albeit a hard climb up the stairs – nonetheless, you can get a spectacular panoramic view of the entire island from its top --- simply breathtaking! #2 - Osmena’s Campsite (Mantalongon, Dalaguete): Wake up your adventuresome spirit as you and your buddies ride a “habal-habal” (motorbike ride with a maximum of 6 passengers) towards Osmena’s Campsite’s jump off point, where you will all need to register and get a tour guide, as you trek to what is called Osmena’s Peak – a mere 30-minute hike but lo and behold! This mountain top features no less than a stunning sunrise as well as a captivating sunset… sometimes you can even catch foggy scenery up there. It usually has cool weather so better prepare your sweater, on top of your food and drinks. By the way, don’t you litter and preserve Osmena’s Peak’s inviting atmosphere! #3 - Dao Falls (Samboan): Take hold of the many chances to see waterfalls in Cebu – one of them is majestic 90-feet high Dao Falls! There is a minimal entrance fee to pay upon registration at the jump off point and then you get to have a tour guide for your entire 30-40 minutes hike or so. Revel in the enchanting landscape all around, under the clear blue skies, even as you cross a rustic bamboo bridge to get to Dao Falls. Mind you, it is not an easy trek, but upon reaching it, there’s fun no limit when you start swimming in its cool and clear pool of water, while you take tons of pictures to document this adventure! 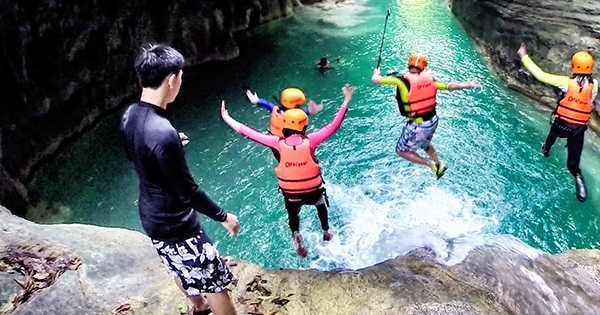 #4 - Kawasan Canyoneering (Matutinao Beach Resort): is also one for the bucket list, people! Kawasan Canyoneering is only for the brave-hearted though – because it involves many agility skills such as scrambling, climbing, jumping, swimming, walking and rappelling, combined. You have got nothing to worry about though because this whole exciting experience is not without the guidance of expert assistants well-provided for by its management. Expect lots of pleasure as you and your team explore the mountain of Barangay Matutinao, where you can also find alluring Kawasan Falls. Smashing! #5 - Pescador Island (Tanon Strait, Moalboal): translates as “Fisherman Island” from Spanish, Pescador Island is absolutely teeming with marine life! Thus fishing, diving and snorkeling – friendly, you will adore seeing its healthy coral reef, sea turtles, Nemo and his siblings, frog fish, dolphins, thousands of sardines, etc. This sublime island is surrounded by very deep and clear blue waters, and sometimes jelly fish can also be seen around, so just be very extra careful as you and your company spend time there. Otherwise, your visit is superb all in all so have a ball!